I have been quite busy with work lately, but this upcoming week will be a little bit more focused on other things. Tomorrow I will participate in the annual meeting held by Föreningen Storsjöodjuret (translates roughly to The Great Lake Monster Association), which is open to the general public. This annual event takes place in different towns and villages around Lake Storsjön (The Great Lake) every year, and tomorrow we will be in a location called Hara. So I will be back with a report on this blog tomorrow night. 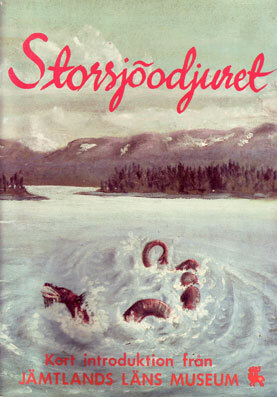 Seen above is one of the classic local publications about The Great Lake Monster, written by Ulla Oscarsson and published several times in different editions – including one that was printed in English way back – by the local museum (called Jamtli), since 1986. This has been a good inspiration for decades for people that want to take a look at this mystery. Jamtli has a collection of hundreds of witness reports and news clippings in their archives. The front shows part of a 1935 painting by Harald Millgård. Glad to be part of this in my own way, it is a very interesting subject.